I'm so excited and I just can't hide it. For real. 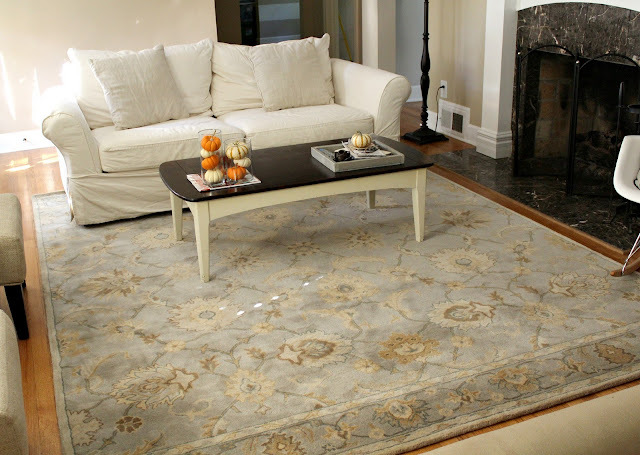 David and I have been pinching our pennies and finally bit the bullet with a new rug for the living room! 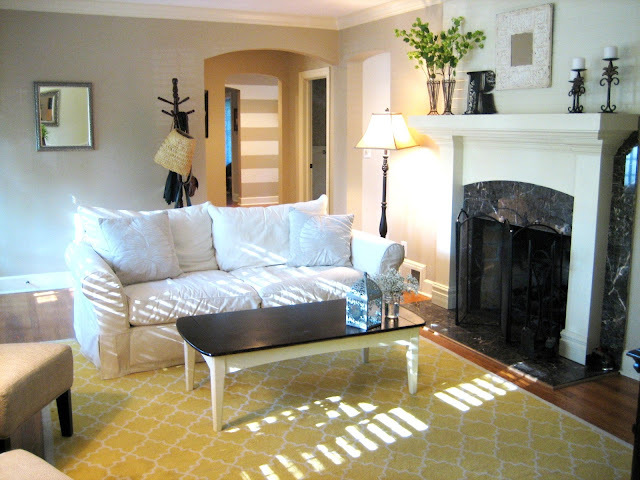 I know so many of you love the rug we currently have in the living room- the Pottery Barn Moorish Tile rug in yellow. Trust me- we love it too! It just isn't working for the vibe we want in the living room these days... calmer, more neutral, more chill. 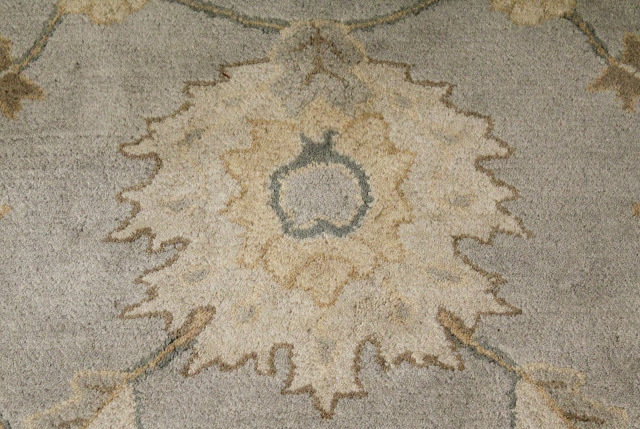 This rug will work its way into another room in our home, I promise! I thought we'd found a deal on a rug at my trip to the discount home decor store, Real Deals. But the colors weren't working right, the rug wasn't priced great and the store took no returns. Meaning if my crazy self got the rug in our living room and hated it, we'd be out of luck. So I turned to a trusty old source- Pottery Barn. Just like with our love for the previous Pottery Barn rug, I'm thrilled with the quality of this rug. It's the Gabrielle rug from PB, which is currently 15% off. 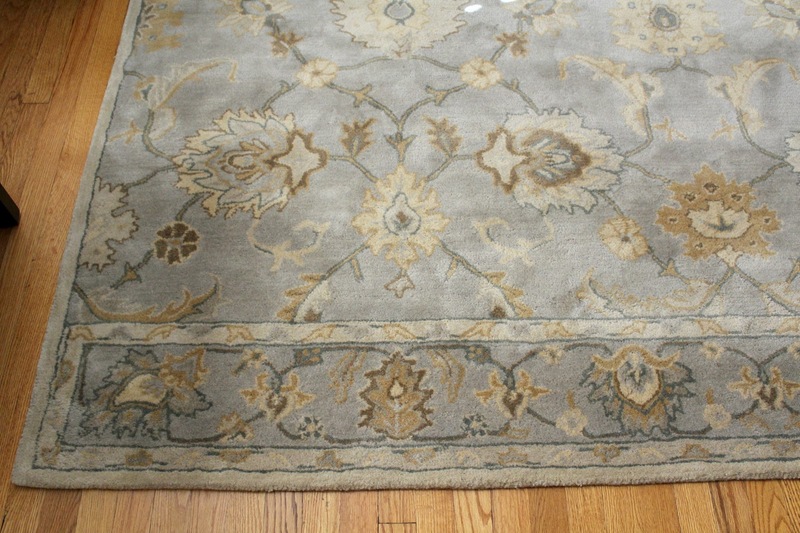 I also stalked researched the location of the rug at my local store and picked it up myself so that I wouldn't be charged the $75+ in shipping. Oh and I had a $15 gift card to PB, so that helped too : ) You know me, never pay full price! My trick with wool rugs that are in a heavy high traffic location (ie. anywhere Tucker and Maggie walk) is to squirt a couple cans of this guy on the rug. It saves my life, I'm sure of it. I just love the rug. But there's actually an even brighter side to this decor choice! After I repainted the trim in the living room a fresh white, I had originally planned to repaint the wall colors in the living room a soft gray like our kitchen. But, with the new rug in place, I'm kind of liking the current color. I think they work well together. So the wall color stays! Of course, I've got a few things more left on my list, like accessories, pillows, etc. The full list is at the end of this post. But I think we are on the right track! Interestingly enough, I'm loving some of the warm tones of my fall decor mixed with the new rug color... hmm....! Rust orange anyone? yes ma'am! That new rug looks much more calm and sophisticated. I've been obsessed with that Moroccan tile rug forever and can't wait to see you use it in a more playful space! it looks great! i think it suits the room more. i "like" the yellow rug as a rug more, but i think the new one suits the coffee table and vibe of the room so much better! very pretty! ill have to check out pottery barn when we upgrade our living room rug. xoxo jillian:: enter to win a custom canvas print! The new rug is really beautiful. I love the soft blue and how it really 'calms' the room. Great choice! looks great!!! oh and i lurve real deals! The new rug really does work beautifully with the existing wall color. Isn't it nice to avoid having the hassle of repainting? it looks great! although i do love love love the yellow pb rug too. 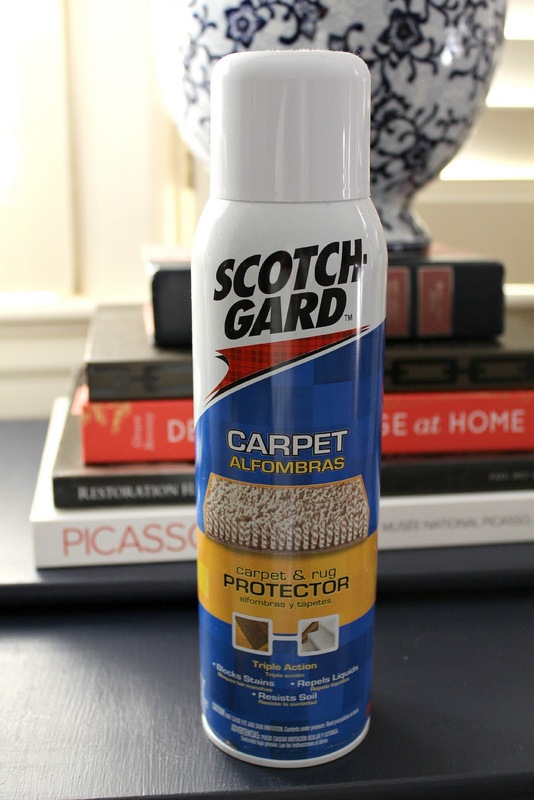 i've never thought to spray scotch guard on my area rugs - i'll have to do this when we finally spring for a new rug for our bedroom - esp since it will most likely be light-colored. oh and keep the wall colors the same - i love the warmness that the room has. the wall colors work perfectly with the rug! That is just too cool! Great pick. Oh it is gorgeous alright! Congrats--it looks great! I LOVE the rug. You can't go wrong with Pottery Barn! It looks great with the wall color too! 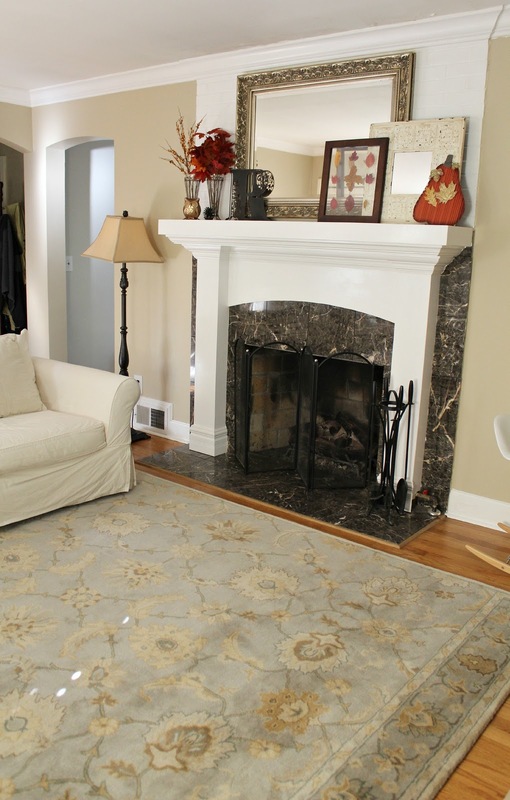 Love the new rug!...are you by chance selling your old rug? Looks great, nothing more exciting than getting a new rug! Looks amazing in that space! A big step to change out a rug that made such a statement before:) The new rug is gorgeous and does lend that relaxing, sophisticated vibe. I just ordered a natural fiber PB rug too (for our dining room). i really like it! the colors are so pretty and can pretty much match anything :) and yay for not paying full price! Great minds think alike! Ha! I have a similar look going on, I'm so done with my goldish walls and seeing yours totally confirms they need to go asap! So pretty! I really like the new rug. It blends so nicely with the wall color and furniture. Just lovely. love the rug rb!!! looks amazing. perfect. I am smitten with the new rug! It adds a layer to the room that definitely rations up the calmness! I love that rug! Great colors, soft and muted. Looks fabulous with the wall color as is. Beautiful choice. I like the wall color as well and how great you no longer have to paint it. Such a calm and pretty space. Love the new rug!! I'm totally inspired by your public to do list. I've been updating the apt, but I believe if I do the list like that, I'll be apt to keep it top of mind. and well, prioritize those purchases. Which is difficult, rug or shoes?!? 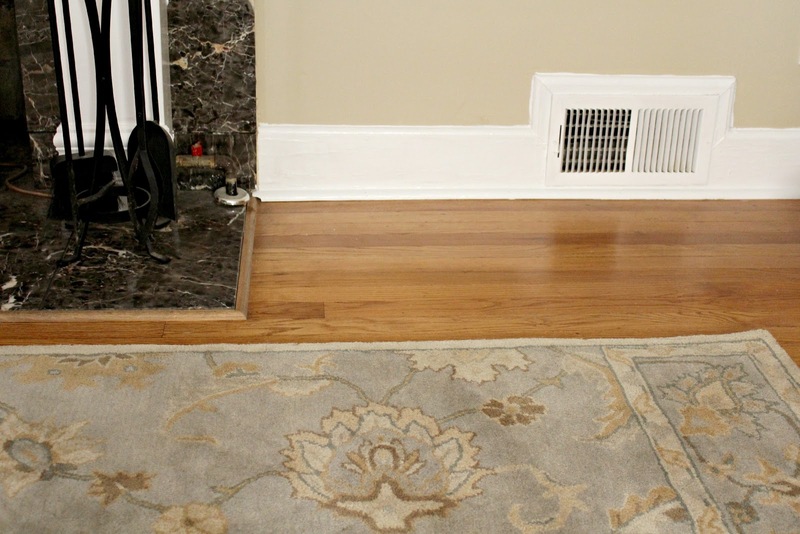 Michelle - love the rug and like the Scotch Guard protectant. Funny you should mention liking the warm colors. We're searching out colors for a new paint job in the family room and kitchen and I keep leaning towards those fab oranges and golds. Thinking they would be better as accents. God job on the room...keep it up. It looks perfect! We have a similar PB rug, and I love it. It's nice and neutral with a little bit of interest. And I agree, it looks perfect with your wall color! love the new rug - perfection! Wow -- totally changes the whole room vibe!!!! Great choice. Where do you find the Scotch Guard?! I've been looking for some for my kitchen rug...does it preserve color too? and you're killing me with the cupcakes!!! Love the new rug! Totally changes the whole vibe of the room. I liked the other rug too, but I like this new direction even more! Love the color of the rug! Definitely a room I'd want to come home to after a long day. As much as I love modern geo-prints, there's something so calming about a traditional, neutral print AND it's an investment that won't go out of style. Have you started your gallery wall yet? I just bought some hobby lobby frames today to start mine -- can't wait to see it come to life!